Vinyl is a practical, functional and fashionable option for today’s active households, and it is also known to be cushiony and warm underfoot in comparison to natural stone or ceramic tile. As with anything, you get what you pay for. As you move up in the vinyl price range there are many benefits. In terms of product selection alone, more versatile patterns, colors and textures will be available to you. As far as performance, today’s premium wearlayers offer superior resistance to stains, scuffs and scratches, which is important if you live in an active household, or with kids or pets. Some premium wearlayers are enhanced with aluminum oxide, which provides exceptional resistance to scratching. More importantly, these wearlayers make clean up even easier. You’ll also notice that, as you move up, you’ll get enhanced performance constructions, guaranteed to protect your floor from rips, tears, and gouges. 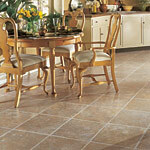 Quality underlayment will make a difference on the wear of your vinyl floor. Harder wood species, and more plys (per sheet of underlayment) will increase the density of your subfloor, thereby making your vinyl floor less susceptible to gouging or denting. Classic Carpet & Flooring uses a 5-ply Birch underlayment (a very high quality underlayment). Remember that size should determine style. When selecting a vinyl pattern, you want to consider the size of the room and the size of the pattern. When working with vinyl flooring pattern sizes, a smaller pattern works well in small areas or in rooms where the pattern will be visually interrupted with pieces of furniture, or a kitchen island. However, keep in mind that larger flooring patterns can sometimes actually visually expand a room. When considering vinyl flooring styles you’ll also want to consider any printed fabric on your furniture or wallpaper in the room. If the fabric or wallpaper is a large-scale print you’ll want to look at smaller patterns for the floor. Conversely, if you have a small-scale pattern in the fabric or wallpaper you’ll want a larger pattern for the floor. Be sure to consider the gloss. Vinyl flooring products come in a selection of gloss levels to suit your needs. Generally speaking, the lower the gloss level, the more forgiving your floor will be to the daily wear of foot traffic. Call or click to set up your no obligation shop-at-home appointment today.